Chey Tae-won, the owner of most of ailing South Korean conglomerate SK Group who currently out on bail on charges of illegal share dealing, faces a fresh investigation. Mr Chey, who chairs SK energy subsidiary SK Corp, as well as heading the group's founding family, was sentenced in June to three years' imprisonment for a variety of financial offences. Now, Korean prosecutors want him to answer charges of accounting fraud . 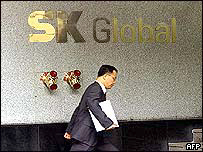 SK Group, which is involved in businesses from mobile phones to engineering, is struggling to reinvent itself after a 1.6 trillion-won (£833m; $1.4bn) accounting scandal at its SK Global subsidiary in 2001. According to prosecutors, that fraud may have been much larger than previously thought, and Mr Chey is being called upon to explain himself. Mr Chey is currently appealing against his earlier conviction, and intends to throw himself back into managing SK now that he is on bail. He will be instrumental in negotiating a restructuring at SK Global, which last week rebranded itself as SKN in an attempt to shake off the taint of its accounting scandal. SKN has already been promised money by SK Corp, the unit that Mr Chey manages. But the process has already run into heavy criticism from foreign investors and reformers, who argue that it smacks of the sort of "crony capitalism" that new President Roh Moo-hyun has promised to stamp out.